Have I mentioned that I used to have a fabulous memory? Yes, I used to. But somewhere along the way, my brain cells have stopped processing information. It’s a shame. I forget a lot of things – whether I’ve fed the cat, if I set my alarm, are my car keys in my purse. It’s a real accomplishment that I manage to get myself out of the house on a daily basis. Mostly, I try and hide this flaw from public view. I write myself notes. I keep three separate calendars. I set two alarms each night. But some details just don’t stick. Like the fact that my friend Anne does not eat meat. Not that this fact comes into play on a regular basis in my world. But on the occasions that she is in town and at my house to enjoy a meal, it really would behoove me to remember that pasta with meat sauce or chicken pot pie isn’t really going to appeal to her. Like the other week when it wasn’t until the pot pie was in the oven that I remembered I wasn’t sure if Anne ate chicken or not. And I did not immediately have a Plan B. Thanks to my current obsessive/compulsive fixation with waffles, I managed to turn this potential dinner disaster into a major save. See, I had recently made a batch of overnight waffles and had some leftovers lurking in the freezer. So when Anne confirmed that chicken pot pie sounded lovely but that she didn’t eat chicken, my mind quickly started to take a mental inventory of what other choices were available. Since I can’t seem to remember squat, I had to start opening cabinets, cupboards, refrigerator bins, and the freezer to see what our options were. It was there that I spotted my frozen waffley salvation. The beauty of the frozen waffle is that it goes from freezer to plate very quickly. So as the pot pie was finishing up in the oven, frozen waffles went into the toaster and some eggs got scrambling. By the time the waffles and eggs were plated, the pot pie was ready to be served. Anne felt bad that I made a separate meal for her but what she didn’t realize was that A) I should have made sure I inquired about any dietary restrictions and B) I totally scored by having more chicken pot pie leftovers. And if she’s reading this post, I hope she knows that it was my pleasure to give her some breakfast styled dinner and any additional pot pie leftovers were merely an unintended bonus. I’d also like to thank her for giving me the idea for this post. She left a comment on the Sour Cream Waffles asking if they were the ones she had at my house. I said no, but that I hadn’t been able to come up with a story for the ones she had. And in that moment, I knew what this story would be. It would be about a superhero (overnight waffles) saving a damsel in distress (me) from a villainous rascal (my ever failing memory). If only I were an artist, I could totally turn that into a comic…the Adventures of (Waffle) Iron Man. BAH Note: Generally speaking, I liked these waffles. I liked that the batter could sit in the fridge for up to 24 hours which made them a great weeknight breakfast for dinner option. I liked that the exterior was thin and crisp but I found that as I worked my way through the batter, later waffles were dark on one side while pale on the other. Earlier waffles were evenly browned on both sides. I didn’t detect a difference in the taste of these later waffles. I got about 14 regular sized waffles from one batch of batter. So plan on either feeding a lot of people or storing well wrapped leftovers in the freezer for later enjoyment. When choosing your bowl, remember that the batter will approximately double in size. So make sure that you give yourself enough room for the batter to grow without turning your refrigerator shelf into a yeasted waffle swamp. Combine the milk and butter in a microwave safe bowl and heat on 50% power until the butter is melted. You want the liquid warm but not boiling. Let cool for five minutes. Meanwhile, whisk together the flour, sugar, salt, and yeast in a large bowl. In a second bowl, whisk the eggs and vanilla. Slowly add the cooled milk mixture into the dry ingredients and stir until the batter is smooth. Add the egg mixture to the batter and mix until all ingredients are completely combined. Cover the bowl tightly with plastic wrap and refrigerate for 12 to 24 hours. When ready to cook, remove the batter from the refrigerator while you heat your waffle iron. Whisk the batter until it has deflated and the ingredients have been reincorporated. Using an ice cream disher, place one scoop of batter into each waffle mold and cook according to your waffle maker’s instructions. 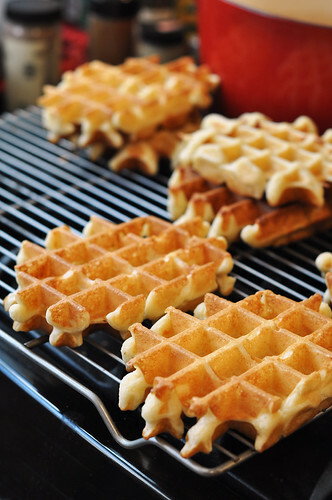 Leftover waffles should be cooled completely before wrapping in a double layer of plastic wrap for freezing. Flashback Friday – Did Someone Say Pie? Tes, the waffles were pretty fantastic. I hope you will try them soon. Jennifer, I was a complete Whose Line fan…but only the original version with the Brit host. Although I must admit that Wayne Brady made the Drew Carey version tolerable. I loved them both! Have you ever seen Brad Sherwood and Colin Mochrie together on tour? If they come to your area, run don’t walk! No, I don’t get out much. But if I see that they’re headed to B’more, I will have to make a point of checking them out. Awesome job! And even though I do eat meat, I LOVE waffles for dinner – nice save and a great story! Debra, I think it ought to be a rule that you have breakfast for dinner at least once a month. These waffles make that a very achievable goal. Hmmm, maybe I need to throw another batch together to stash in the freezer. Good save there! I think she may have been stuck with a grilled cheese at my house! Kitch, how sad is it when I don’t even have the fixings for grilled cheese? Uber sad. Tracy, I don’t always know what is in my freezer so I got lucky this time. Homemade gnocchi? Yes and please. these waffles are amazing! and i wish i could eat some right now. wendi, you are a wonderful hostess! Anne, if you were here right now I’d make you some of these waffles. By the time you could drive here from Boston, the batter would be ready! What a great story, love waffles so I’d be happy too.